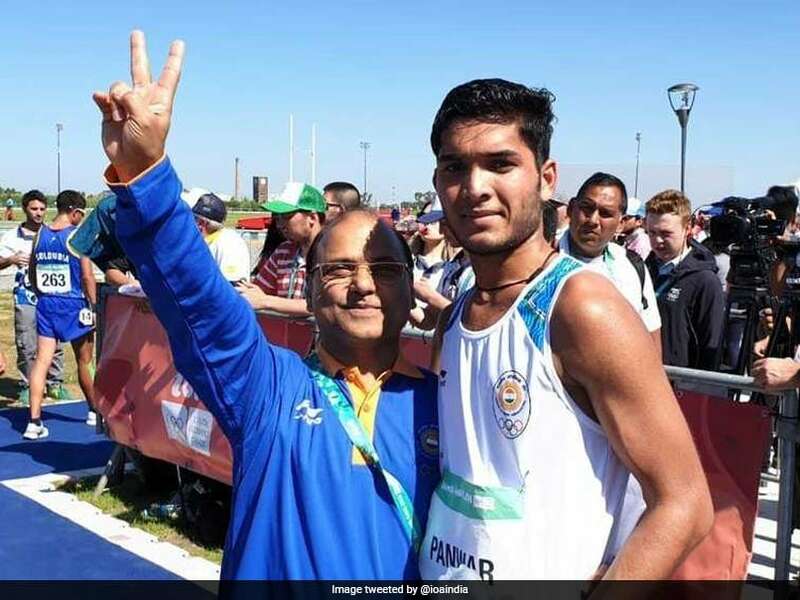 Suraj Panwar's silver is India's first athletics medal in the 2018 edition of the Youth Olympic Games and third overall. Suraj Panwar clinched a silver in men's 5000m race walk event to open India's medal account in athletics at the Youth Olympic Games but country's boxing challenge ended with quarterfinal defeat of Jyoti Gulia. Panwar won the stage 2 competition by clocking 20 minutes and 35.87 seconds on Monday night but finished second overall. In a new format, there are no finals in track and field (with the exception of 4km cross-country) in the Youth Olympics and each event is held twice, with results from both rounds counting towards the final standings. The 17-year-old Panwar had finished second in the first stage in 20.23.30s, behind Patin Oscar of Ecuador. Panwar's total time of 40:59.17s was over seven minutes slower than Oscar's 40:51.86s. Puerto Rico's Jan Moreu finished third to claim the bronze. This is India's first athletics medal in this edition and third overall. Arjun (men's discus throw) and Durgesh Kumar (men's 400m hurdles) had won a silver each in the inaugural edition in 2010. "It's a great feeling. I am very happy to have won a medal. I had put in a lot of hard work for the Games. It is my first medal for India," Panwar said after winning the silver medal. "My next target is to better my performance here and win a medal in the senior level also," he added. India's boxing challenge though ended at the very first hurdle after former world champion Jyoti (51kg) lost her quarterfinal bout to Italy's Martina La Piana. Gulia was the lone Indian boxer to qualify for the Games owing to her world title and lost in a unanimous 0-5 verdict to the Italian on Monday night. The 17-year-old Indian from Haryana was expected to do well at the event given that she was coming off a gold medal-winning performance at the Silesian Open in Gliwice, Poland last month. India's maiden and only set of medals in the Youth Olympics' boxing competition came in the inaugural edition of 2010. Shiva Thapa and Vikas Krishan delivered a silver and a bronze medal respectively, which remain India's best performance. While Shiva won his silver in the 54kg category, Vikas finished with a bronze in the 60kg division. In 2014, the best that India managed in boxing was Gaurav Solanki's fourth-place finish. Solanki (52kg) won the gold medal in this year's Commonwealth Games. Meanwhile, archer Himani was eliminated from the women's individual recurve event after losing her 1/8 match 4-6 to American Catalina Gnoriega.